170l (45 Gal) Rainstation Granite 170L/45 US GAL multi-purpose rain barrel ideal for all outdoor chores in addition to saving water and reducing run-off. 170l (45 Gal) Rainstation Granite is rated 4.4 out of 5 by 30. Rated 5 out of 5 by boltfan from love my rain barrel this is the second time i bought this same rain barrel and i love them! 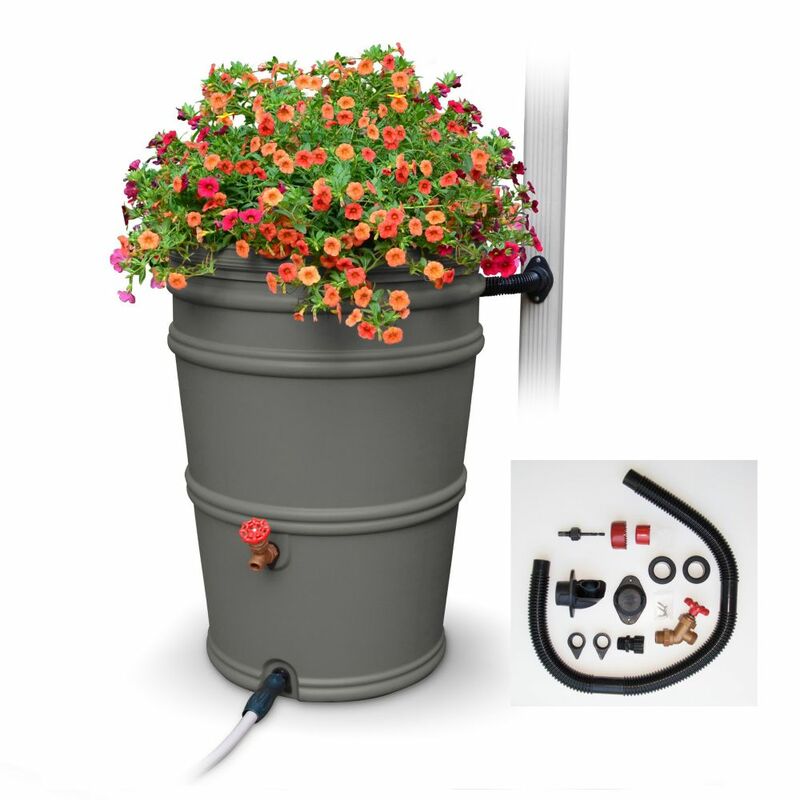 so easy to install and even come with the tools.the best part is the topof the rain barrel can become a beautiful garden on top.i have an herb garden on one and i am thinking flowers on the other.every time it rains(or fog) i feel like i am getting free water delivered!!! Rated 3 out of 5 by Homeowner from Not great, not bad. You'll want to get another spigot - brass instead of the cheap plastic. Rated 4 out of 5 by lilw from Good quality, and easy to install. The rain barrel is nice looking and good quality. The only thing I don't like is the valve that fits into the rain gutter only collects a small portion of the water going through. The rest goes on through the gutter and is wasted while the barrel is slow to fill. It would be better if all of the water went into the barrel with an overflow valve when the barrel is full. Rated 4 out of 5 by Leslie from Works well We were able to assemble this on our own and it does what we were hoping for! I really like that you can plant in the top - helps conceal how large the barrel is. Rated 5 out of 5 by BrotherPi from Great Product! The barrel is great and easy to install. Everything you will need comes with the kit (except the drill, of course!). The one issue I have with the barrel is the top. It is hard to get the top completely on the barrel the first time. After that, it is not too difficult. I hope you enjoy this as much as we do! We purchased two, and will probably get two more. Rated 5 out of 5 by Scott from great rain barrell - love it! Great rain barrell. Very easy to install and comes with the drill bit to attach to your power drill. I love that this has a built in gutter diverter that sends the water back down the gutter when the barrell is full. There are even 2 spouts so you can connect your hose and still have a spout for a bucket or watering can. Solid product and easy to install. It even has a winterizer cap for the winter when you disconnect the barrell. Rated 5 out of 5 by bmm1 from Great investment Great product at a great cost. Easy to install and use and looks awesome when using the planter on top! Rated 4 out of 5 by GONZO from Not a bad barrel Came complete with diverter kit and hole saws. Was easy to assemble. Wish the spigots were better quality.